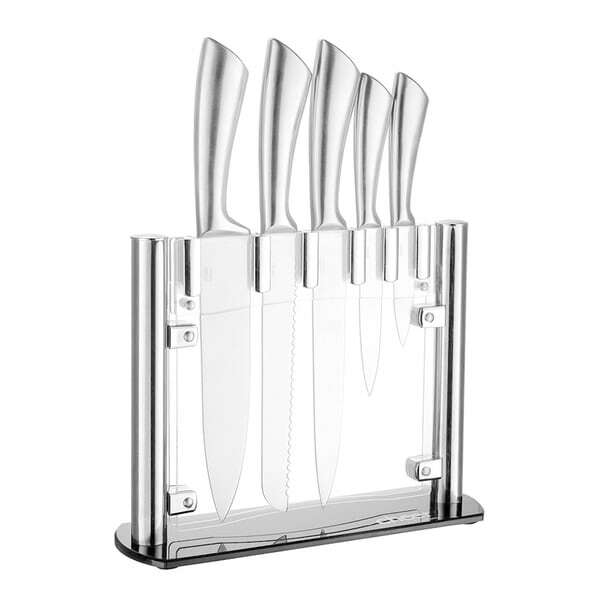 This Cheer Collection 6pc stainless steel knife set is very nice. I originally purchased this item for my wife and was not expecting the knives to be very good. My wife cooks a lot and has other very expensive name brand knives so i purchased this set more for the stand. We were both surprised by the build quality and sharpness of the one piece knives. They fit perfectly in the stand and in your hand. They are one piece knife and handle so the handle will never become loose. If you are considering this set, dont hesitate! You wont be disappointed. This set looks very nice displayed in any kitchen looking to match with the stainless steel appliances. I give it 5 stars because they not only look great BUT they are very sharp knives. I was not expecting such a good grip for the low cost of the knives. The knife set looks nice on the counter but the point on each knife is very sharp. We used the knife set to help prepare Christmas dinner and my friend and I received puncture wounds. Very classic set looks great in my kitchen .. Very sharp knives too ! This is a beautiful set and the knives are sharp. My only complaint is that the stand holding the knives is black and doesn't coordinate well with the knives. Other than that, I was very pleased with my purchase. Looks nice and the knives look high quality. I got it for a gift so i will not be using it and wont be able to review how they cut. My husband loves them and I do Too!!! Quality is there in the knifes. Theses knifes give a very elegant look to your kitchen and they work amazing. Ugh, not the best quality, Looks and feels cheap. It’s a balancing act. Super sleek and clean design. Easy to use and easy to clean. Would definitely recommend. I would definitely recommend this product. Beautiful stand not your ordinary butcher block stand. It pops with originality. Love ! Beautiful knife set and sharp as well. After one use started to rust. My son wanted a new kitchen set for his job at the Hilton.